Archival documents contain all kind of interesting information, especially when they are published in full. 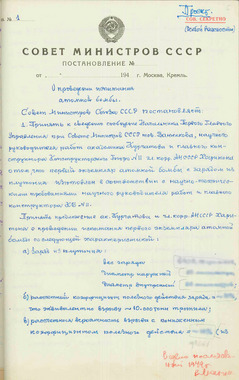 A while ago, someone discovered that the Russian Federal Archival Agency published a collection of documents on the early days of the Soviet nuclear weapon project as part of their project "Archives - to schools." The collection itself is very interesting, but one document definitely stands out. It is the draft of a Council of Ministers decree "On conducting a test of the atomic bomb." The draft was handwritten by Igor Kurchatov and dated 18 August 1949. The test of the bomb, known as RDS-1, was conducted some days later, on 29 August 1949, at the Semipalatinsk test site. c) expected probability of an explosion with decreased efficiency is =~10% (of which in the 5% of cases expected yield of the explosion is equivalent to an explosion of 10,000 to 3,000 tonnes of TNT and in the 5% of cases - less than 3,000 tonnes, but not less than 300 tonnes of TNT). These are the numbers that have never been published before. Indeed, the copy of the document has pencil marks around the numbers with handwritten instructions to take them out. But someone apparently didn't follow the instructions. The numbers were taken out a few days after the document was "discovered," but the information has already got out. At this point, of course, these numbers have mostly a historical value, but they are quite interesting anyway. And not only for the history of the Soviet program - since RDS-1 was a copy of the U.S. plutonium devices, these numbers also provide some insight into the first U.S. nuclear weapons. At 6.4 kg, the RDS-1 core was a bit heavier than that of Trinity, which reportedly used 6.1 kilogram of plutonium (see footnote on p. 184 in this paper). The RDS-1 dimensions are most likely also very close to those of Trinity, but it's hard to tell - I don't think the size of the Trinity core has ever been disclosed. The efficiency estimates are very interesting as well. The 10% estimate assumes fission of about 640 g of plutonium, which would be equivalent to about 13 kt. The first measurements, conducted after the test, suggested that RDS-1 produced an explosion with a yield of about 10 kt, which was a bit lower than the expected value, but not inconsistent with it. However, that initial estimate was apparently based on the energy of the blast wave, so the total energy release was probably higher. The official account of Soviet nuclear tests lists RDS-1 as having the yield of 22 kt. But it's a somewhat different story. Now to the probability of a fizzle. Kurchatov's estimates appear to be consistent with the analysis that is based on Carson Mark's paper on the explosive properties of reactor-grade plutonium. Figure A-1 on p. 183 there suggests that one would get 10% probability of a less than nominal yield at Pu-240 concentrations of about 0.5%. This is consistent with the Soviet plutonium production records - according to the data in Anatoli Diakov's paper on the Soviet plutonium, the first batch of about 10 kg of plutonium was produced in a 100 MW reactor during a campaign that lasted about 100 days (the reactor core contained about 120 tonnes of natural uranium, see pp. 32-33). My quick estimate showed that this plutonium would contain about 0.7% of Pu-240 [Update: I corrected my estimate - it's 0.7%, not 0.35%]. A more careful look at these numbers could probably tell more about parameters of the RDS-1 implosion process. However, one should be careful about interpreting these data - as it turned out, Kurchatov's estimates used wrong values for the neutron background - the Soviet scientists discovered in 1950-1951 that the neutron source that they were using in 1949 to calibrate their instruments was actually about 20% stronger than they thought. Accordingly, the measured values, which were used in calculations, underestimated the actual neutron background. The fizzle probabilities were recalculated in 1951, but we don't know what the new values are (we know, however, that they were still within the acceptable limits). My final note would be that this document is clearly a very unusual find (as was the one discovered last year - my special thanks to those who helped discover these documents and combed through books on the history of the Soviet program to find other information used in this post). But one does not have to rely on these accidental discoveries to get a good picture of the Soviet nuclear weapon program - a lot of documents have been properly declassified and published. I hope one day someone will put together a detailed technical history of the Soviet nuclear effort that would make full use of that information. There is a lot of interesting data out there. UPDATE 11/27/2015: The entire document has been published as part of the "Nuclear Industry - 70 years" exhibit. For the inner and outer diameters quoted the volume is 3277cm3 and at a density of 19.5 gm/cm3 (alpha plutonium) the mass is 6400 grams.The critical radius is estimated at 4.19 cm and with a compression of 2 the radius is 3.4 cm. The expassion to 2nd criticality would be 0.79 cm in about 10.5 ns. Assuming a tamper and aluminium pusher of say 250 Kg,the yield comes out at 7x10^20 ergs or 16.8K tons TNT (4.2x10^20 ergs/10Kton TNT). A very interesting document you have. Apologies, it is theta plutonium at 15.6 gm/cm. I used the diameter as the radius. This does not change the critical radius or compression radius as this is calculated on the mass. Do you have any imformation on the first chinese bomb(1964). I only know it was uranium 235 and used compression detonation.